Programmatic advertising is all about audience discovery and accurate targeting. All the brands now want to do very specific and apt targeting. They want to select publishing platforms that can fetch in the targeted audiences they seek. In this article Ashish Shah, Founder & CEO, Vertoz says that the productivity that we get from technology will be much extensive than what a media planner offers. So we need to have an amalgamation of the media planner and technology. While a machine would deliver the speed and accuracy, the human touch is always mandatory. The transformation from traditional media buying to programmatic ad buying is at its initial stage in India and we are in the learning phase right now. Once the brand managers understand this technology, they will adopt it. 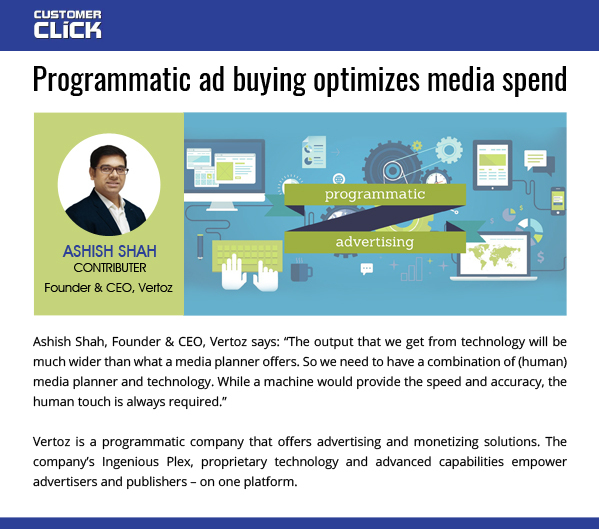 Read more about the programmatic transformation in Vertoz itself. Customer Click is India’s first and premium magazine focusing on all the facets of customer life cycle, running across diverse business verticals. Customer Click is an exclusive platform for the CXO Community of leading companies from corporate India to understand the evolution of their customer. The insides of this magazine are wisely crafted to empower any business or technology head to originate how the customer strategies and experiences work together. Other content can be diplomatically implied on their businesses to take them to new levels and enroll larger chunk of customers worldwide. Vertoz is among the best display ad networks for the publishers. We build our own technology that helps us to provide services and solutions to our valued customers. Vertoz is among those ad tech companies where we empower a global roster of top advertisers and publishers all under one roof. When we exchange facts about programmatic advertising technology, we cater out best ad buying system. Thus, we are helping more and more people to opt-in and try out digital advertising in this industry. People will soon start accepting programmatic and benefit from it. We provide you with better targeting along with tracking performance and analytics.